We don’t want them to cut trees anywhere in the city because there are so few of them left now. We study in Tolichowki and there are barely any playground areas for us to go out and play. 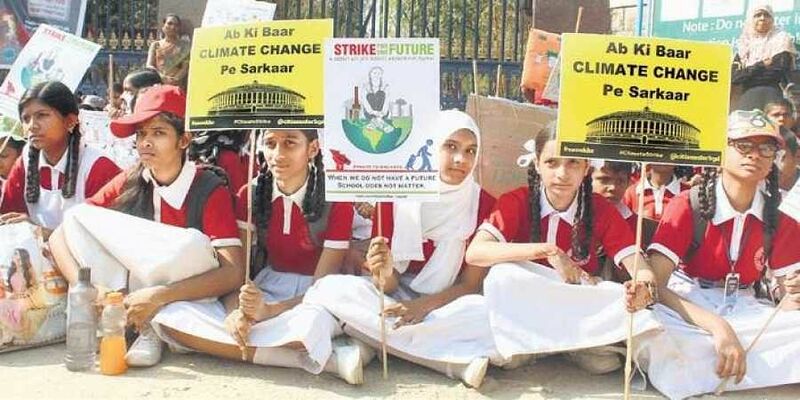 HYDERABAD: Over 500 children from 15 schools of Hyderabad participated in a global protest against climate change on the clarion call of a 15-year-old Swedish girl, Greta Thunberg, who has been fighting for a change on the issue of global warming in her own country. The children, who came out in thumping support of the movement, had not only backed Greta’s call for global intervention but had laid out their own set of green demands for the State, seeking a ‘master plan’ that would keep climate change at the centre of all developmental plans. KBR national park, where the students had gathered for the protest, has been in the middle of a controversy over the proposed construction of SRDP flyover, that would reportedly result in the elimination of over 1,500 trees from the walkway area of the park. Holding hands and forming a human chain, they urged the State government not to take up the project. “We don’t want them to cut trees anywhere in the city because there are so few of them left now. We study in Tolichowki and there are barely any playground areas for us to go out and play. We may not be able to come to KBR park daily, but the fact that it is maintained for the children living around is a good thing,” said Rumana Tabbasum, a student of Venus Girls High School. Several other children were there to raise awareness about the rise in air pollution caused due to increasing number of vehicles and the role trees could play to combat the same. “If they cut away these last surviving trees, the pollution from traffic and all the dust would impact us directly and adversely,” added 10-year-old Jaswanth from a government school in Film Nagar.